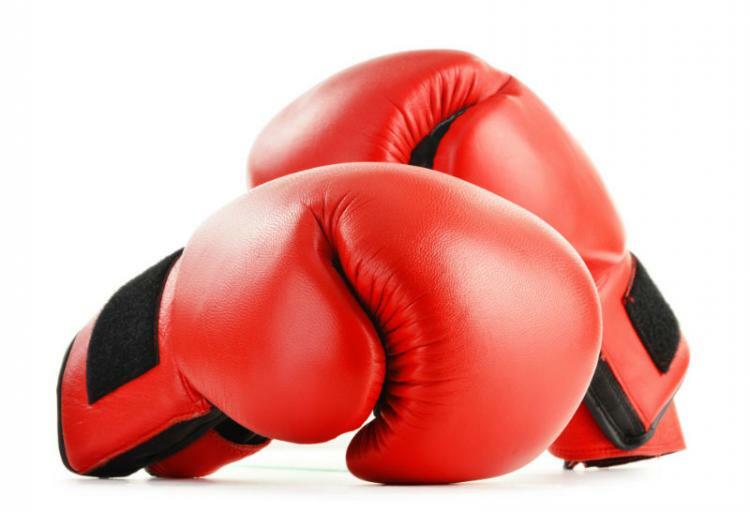 Combat sport practitioners commonly share the problem of having their boxing gloves emit a distinct odor. This occurrence is especially prevalent among those who do not use hand wraps. The odor is a direct result from the sweat absorbed by the gloves and from the bacteria growing within them. If not taken care of properly, the moisture left in your gloves will continue to become a perfect breeding ground for bacteria. This article describes different methods for cleaning and keeping your boxing gloves smelling fresh. Do Not Keep The Gloves Inside Your Gym Bag - Remember to take out the boxing gloves from your gym bag as soon as you get home. Being forgetful and leaving them inside the bag is terrible since their is lack of air circulation results in all the moisture already present to be trapped. Hand Carrying Your Gloves - It is also typical for people to hand carry their gloves as they leave their training facility. This routine keeps the gloves outside the gym bag and starts the drying out process as you head home. Whether your boxing gloves have laces or velcro straps, make sure to loosen up your gloves to maximize its exposure to the surroundings. Using a Mesh Bag - Alternatively, you can use mesh duffle bags in place or in addition to your current gym bag. The mesh material is great for baring all your training gears to the air, as you carry them around. However, it is still a good idea to remove your boxing gloves from the mesh bag when you go home. Washing Your Hand Wraps - It is a good habit to wash your hand wraps. The odor and bacteria from it may transfer to the interior of the boxing gloves if you are not consistent on keeping them clean. Cleaning the inside and outside of the glove with a product that has antimicrobial properties is crucial for killing the odor and any bacteria that may be present. Simply spraying the glove with air fresheners will only temporarily reduce or mask the smell, but does not solve the root of the problem which is the odor causing bacteria. Examples of Commonly Used Cleaning Products - While plenty of products are used to destroy the bacteria present in boxing gloves, the following are commonly mentioned among boxing gloves owners. Spray Bottle Options - Lysol disinfectant spray or Febreeze antimicrobial spray are popular choices. T﻿﻿﻿﻿﻿﻿﻿﻿﻿ea﻿﻿﻿ Tree Oi﻿﻿﻿l﻿﻿ - A solution consisting of tea tree oil is frequently used by martial arts practitioner, especially grapplers, to wash their face and body after training due to its natural and beneficial properties. Once you have diluted this solution, you can either fill a spray bottle with it or use a cloth soaked with this mixture to clean your boxing gloves. Grab the cleaning item of choice. Spray the cleaning solution or rub the disinfectant wipes inside and outside of the boxing gloves. Use a small hand towel to thoroughly wipe these surfaces and dry it out, so excessive fluid is not leftover. You could also use a fan or a hair dryer to expedite the drying process. 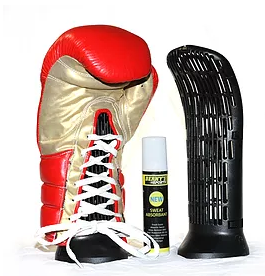 An assortment of items have been developed to assist its user in efficiently drying out the moisture within their boxing gloves. Below are multiple insert items that will be helpful towards this objective. Glove AIR - The design of the Glove AIR insert fits well to the contour of your boxing gloves. Its structure is fantastic for keeping the mouth of the glove open and increasing the air circulation through the glove. The company manufacturing this product also ships a disinfectant spray that absorbs moisture with the pair of inserts. Glove Deodorizers - Stuff this product into your gloves to help absorb the moisture and replace its odor with a new scent. This glove deodorizer from Meister, pictured below, is machine washable and the filling contents are replaceable. 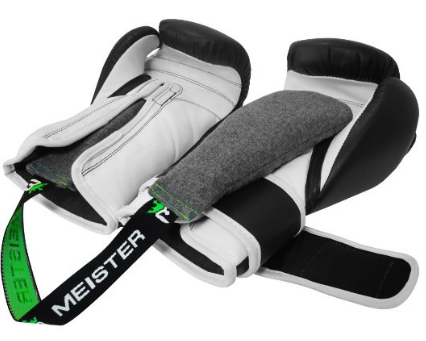 Whether you choose this type of item from Meister or another brand, make sure to not let it linger inside your gloves for too long. Even though your sweat is absorbed by this product, all the moisture is still overall trapped if the glove deodorizer is kept in there for extended periods of time. GloveStix - The GloveStix is a unique object for eliminating the odors for various items, including boxing gloves. The product description states that it has antimicrobial properties because its plastics is infused with silver ions. Additionally, the GloveStix has replaceable bags that deodorize and take the moisture from the gloves’ interior as well. 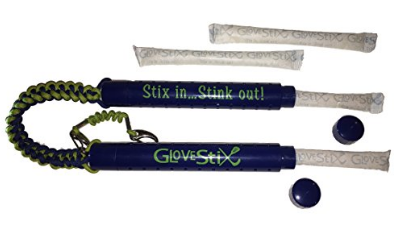 Unlike the glove deodorizer item above, the GloveStix only removes the smell and will not replace it with a different scent. PVC Pipe - PVC pipe is an inexpensive substitute to the Glove Air. It shares the same feature by keeping your glove’s opening widened which improves the air circulation and facilitates the drying of its interior. If you do not have spare pipe parts laying around your garage, then simply run to the nearest hardware store and grab one from the plumbing department with suitable dimensions. Budget Friendly Absorbent - A budget friendly option to soak up the moisture within the gloves is to cram them with newspapers. Even though newspapers are absorbent materials, they are not effective at soaking up moisture as paper towels or a hand towel. The hand towel would be the environmentally conscious choice, since it is reusable after a simple wash. Ongoing maintenance of your training equipment is good for its longevity. In addition to that, it is important to follow the methods mentioned in this article to stay hygienic and keep your boxing gloves from being smelly. Furthermore, it would be a good idea for you to acquire this cleaning routine and turn it into a habit that you do after every training session, so that the odor and bacteria does not get out of control. Otherwise, you will soon find your hands sharing the same distinct odor as well.